A sadya is a typically vegetarian meal, which consists of boiled rice and 10-12 dishes, followed with 2-3 desserts, mostly served at weddings, festivals or special occasions. Must try Payasam (Dessert). 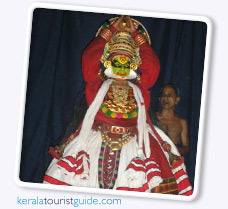 Kathakali is a form of Indian dance-drama. It originated in Kerala during the 17th century. Traditionally, a Kathakali performance is usually conducted at night and ends in early morning. The main facial expressions of a Kathakali artist are the 'navarasams' ( 'Navarasas' in anglicised form )(literal translation: Nine Tastes, but more loosely translated as nine feelings or expressions) which are Sringaaram (amour), Haasyam (ridicule, humour), Bhayam (fear), Karunam (pathos), Rowdram (anger, wrath), Veeram (valour), Beebhatsam (disgust), Adbhutham (wonder, amazement), Saantham (tranquility, peace).